How does it feel to have a vision related reading or learning problem? So reading is not your child’s favorite thing to do. Ok, it is one of their least favorite things to do. Actually it’s like pulling teeth! They hate reading and as a parent you are faced with a dilemma. Your child is struggling and you want answers. If in fact you are one of these parents, you have already begun to talk with your child’s teachers and started extra tutorial programs. But, what if that is still not working? Now you are beginning to wonder what is going on!? You’re suspicious that maybe it could be their eyes! Could it be a vision problem? No, it can’t be! The school said your child passed the vision screening with perfect score of 20/20. 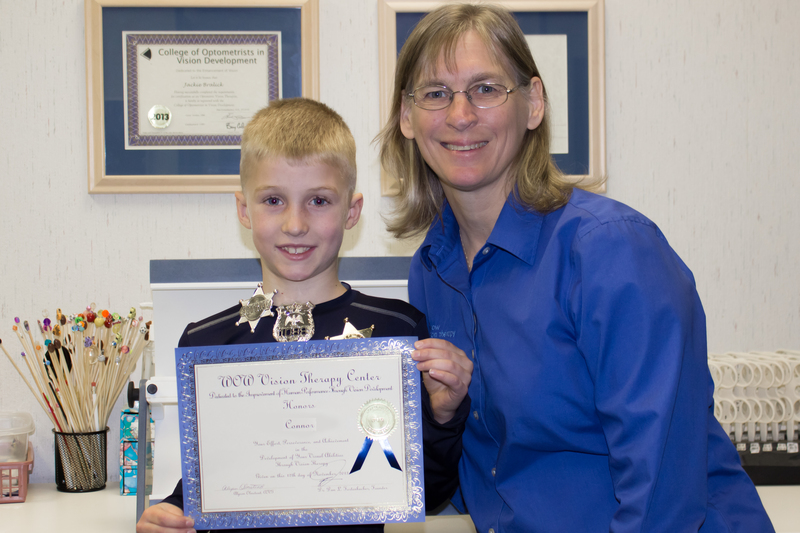 Connor presented with a vision condition that has a medical diagnosis that affects about 1 in 12 children. But, the medical diagnosis name alone doesn’t communicate what it feels like to have this problem. Connor’s condition is treatable with evidence-based research. But, the research doesn’t communicate what it feels like to have this problem. Connor’s condition is recognized by the American Academy of Optometry as being a serious problem and documented with an authoritative organizational Position Paper. But an authoritative Position Paper does not communicate what it feels like to have this problem. Yes, all this is true. Connor is like millions of children who struggle with a vision related reading and learning problem. They have a medical diagnosis, there is research that clearly supports the treatment and doctors and the public have been informed with authoritative position papers. Yet, in spite of these facts, the majority of Americans remains unaware of how these relatively common vision problems tragically affects 2-3 children in every classroom. Just having a medical diagnosis, research or authoritative position papers do not draw public attention to the problem. Indeed the seriousness of the problem remains hidden, an unknown, cloaked behind the technical verbiage. Oh, you say, “Now I get it!” Unlikely!! That’s what it feels like, but now is not the time to simply sit back. Please take a few seconds of your time to share this with friends on Facebook, Twitter and other social media. Yes, you can become a part of the solution to a big problem that affects millions of children in the US, and world wide, who have an undetected vision related reading and learning problem and will struggle in life’s reading and learning challenges because their parents had never heard about this. Share the post "How does it feel to have a vision related reading or learning problem?"